Can you believe up until a few days ago, I had never actually made a pie? 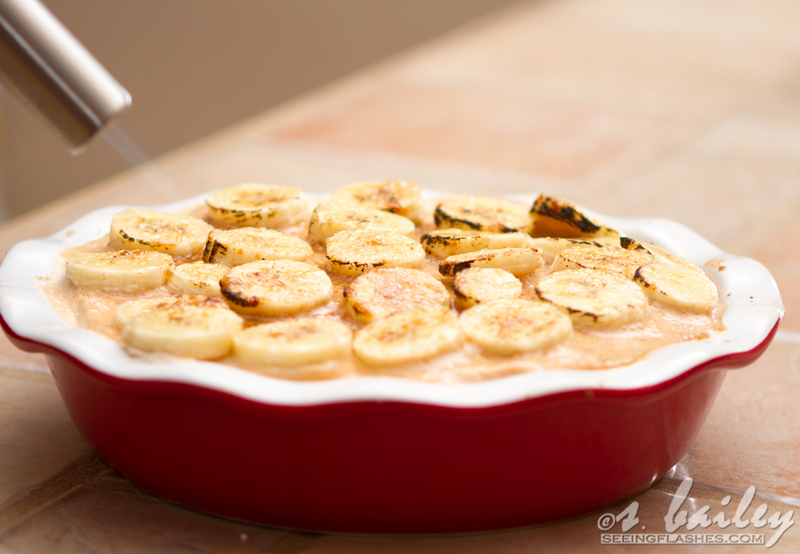 Ever since the holidays, Hermano has been asking me to make pie, and for his birthday he requested a “caramelized banana cream pie”. Quite a request. Not exactly what you’d expect from a teenage boy, but whatev. 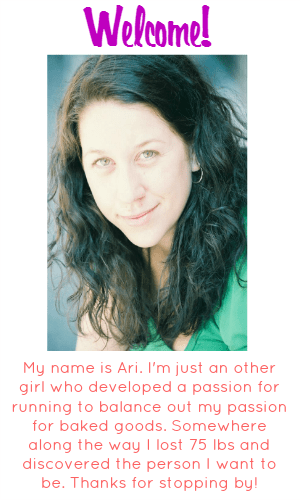 I was thinking about how I wanted to make this thing happen, when I got the brilliant idea to add something I’ve had my eye on to my kitchen for this creation. Say hello to my new friend! You see, I’m still living off the Williams Sonoma gift cards/exchanges we received from our wedding. Instead of buying a million things I may not use all at once, I’ve been saving it, and that way any time I do want to add a kitchen gadget, I can just go purchase it without having to feel guilty about my poor bank account. Side note: life in performing arts is not conducive to a Williams Sonoma habit. I know, you’re shocked and appalled. Here is an other picture of pie to ease the pain of knowing that fun jobs make no money. Such is life, my friends. Anyway, more about this pie. It’s actually really simple. You may have thought I would find the pudding pie route unacceptable for a special occasion, but I heard several people swear by it, and now I see why! 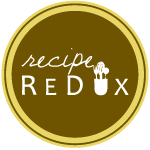 It was ridiculously easy, and the taste was spot on! You see what my new BFF Torchie is doing there? Yes, I name my tools. Every time I refer to my Garmin as “Garmi”, it is not a typo, it’s a nick name. You can tell all of my nicknames are very original, creative, and intuitively thought out. LOOK AT THAT!!!! Doesn’t it make you want one??? I am going to brulee so many things, just you wait! I have plans, people. Big plans. But for now, just enjoy this delicious flavor combination of banana, butterscotch, cinnamon and vanilla, because it is kind of like a piece of heaven. We were all about the action shots that day! Flying cinnamon chips! They are magical. Reserve 1 tbs of crushed ‘Nilla Wafers and set aside. 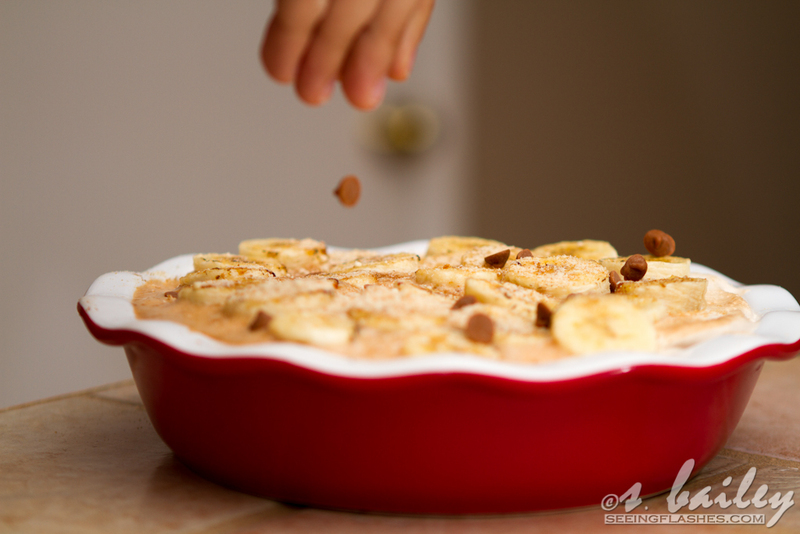 In a medium bowl, combine remaining cookie crumbs with pureed banana. I recommend using your hands. 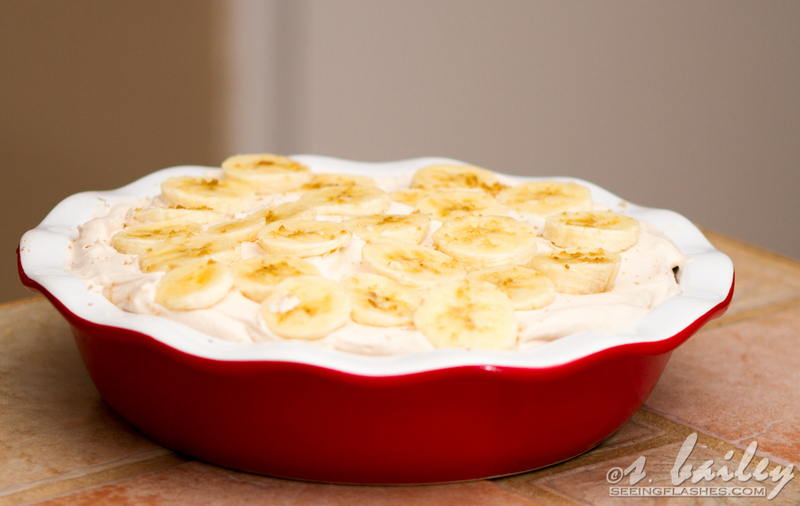 Press banana/cookie crust into bottom and along the sides of a 10″ pie dish. Bake for 10 minutes, then cool on wire rack. Meanwhile, in a medium bowl, combine pudding mix with milk, and almond extract, beating for about 2 minutes. Thinly slice 2 of the 3 bananas on top of cooled crust, spacing evenly. Poor pudding over top of bananas. Gently spread cool whip over pudding. Wrap dish with plastic wrap and refrigerate 5-6 hours. 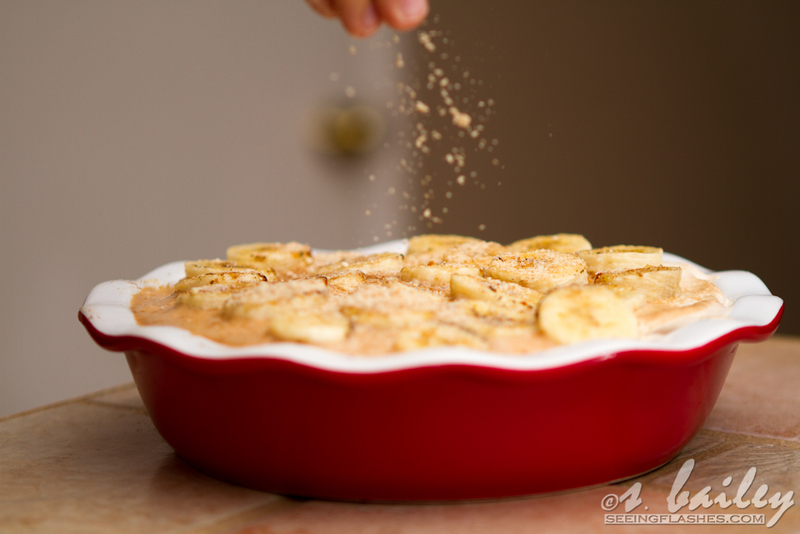 When pie is thoroughly cooled, thinly slice remaining banana on top, then sprinkle sugar over banana slices. 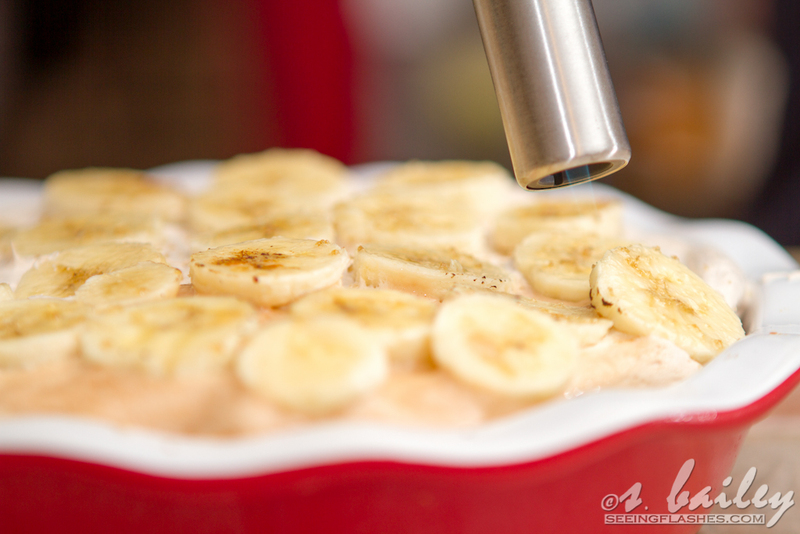 Using a brulee torch, heat all coated banana slices until a crisped, dark sugar layer forms on top. Sprinkle with remaining cookie crumbs and cinnamon or butterscotch chips. Return to refrigerator and cool for 1-2 hours. 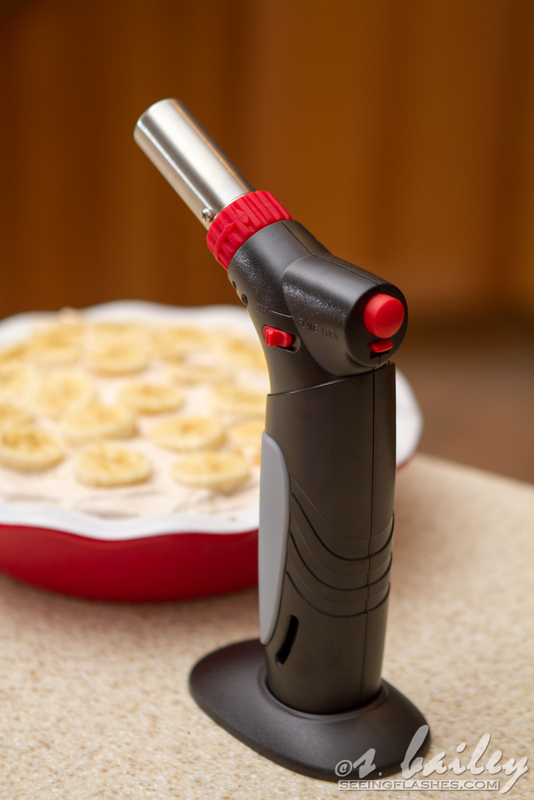 I want a brulee torch so bad…I wish Lance would trust me to own one 🙂 I’m glad to see that this recipe came out well! PS- Is that an Emile Henry pie dish? I have one and its amazing..
Maybe if I let you practice with mine, we can convince him! Annnddd, it’s a Target special. I have no idea haha. You know me, big spender at Target!